What was life like in Ashburn, Virginia 200, 100 or even 50 years ago? 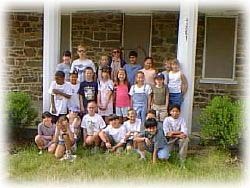 Hillside students wanted to learn more about the land and lives of the families that lived around Hillside Elementary School (circa 1998) and the surrounding community of Broadlands (circa 1994). Several old photographs where given to the school that showed a stone farmhouse, known as the "LeFevre" (sometimes spelled "LaFever") farmhouse (circa 1874) and several out buildings. 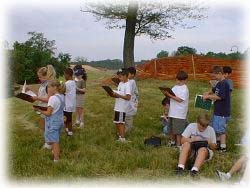 A walking field trip in the spring of 1999 to the LeFevre House and the family graveyard helped the children to learn about a very interesting time in Loudoun County history. 1728: Land Granted (935 acres) to William Sturman and inherited by his son Foxhall Sturman. 1749-1752: Broad Run Chapel or "The New Chappell", first church built (with graveyard) by the Anglican Parish known as Cameron. 1766: Broad Run Church Road (present Waxpool Road) first noted, from then on referred to as Church Road. 1776-1792: Due to the turmoil related to the Revolutionary War, the status of the Anglican Church and its properties is unclear. 1803: Amos Thompson, a noted Presbyterian minister, buys 372 acres "commonly called the Broad Run old Church Tract." 1811: 362 acres purchased by Peter Oatyer to settle the estate of Reverend Thompson. 1829: Peter Oatyer wills five acres, "from the Black Oak tree to the gate to the church lot" to his daughter, Elizabeth Moffett. 1853: Yardley Taylor's "1853 Map of Loudoun County" shows a wood building about where the old church stood, and names its occupants "S. & J. LeFever." It is possible that this house might have been the church converted into a dwelling, which later probably burned down. 1874: John and Samuel LeFevre were living in their new stone home. 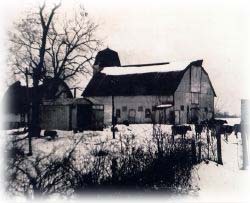 The family named the farm "Hillside." This building is an important remnant of the early history of the Waxpool area. It is a good example of Pennsylvania/German construction techniques brought to Virginia in the late 1700's. This log beam and stone building is virtually square, level and plumb and it is without question the work of an experienced craftsman. 1916: The house and surrounding lands remained in the LeFevre family until 1916, when it was sold to John Smith for his son Earl. Major improvements were made, such as electricity, indoor plumbing and a new front porch. The Smiths lived in the house for 8 years. 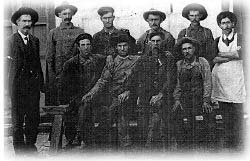 Thereafter, the farm was operated by tenant farmers. 1959: The house and 504 acres were deeded to Brewster Cornwell. 1960: Deeded to Goose Creek Acres, Inc.
1986: Deeded to Van Metre at Goose Creek . 2013: Hillside celebrates 15 years of quality education and service to the Broadlands community! 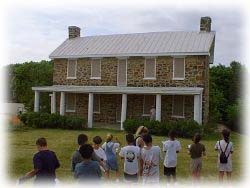 Historic American Buildings Survey: LeFevre House, Loudoun County Deed Books & Tax/Land Books provided by the developers of the Broadlands community. An Archaelogical Reconnaissance and Historic-Site Survey Of the Broad Run Church, Graveyard, and Environs At Broadlands, Near Ashburn, Loudoun County, Virginia, by Eugene M. Scheel. Old Photos provided by Besty Carter (descendant) and developers of the Broadlands Associates. Digital images taken by Mrs. Adams, TRT.